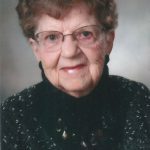 Barbara R. Clauser, age 89, a resident of Grayslake, passed away Saturday, September 27, 2014 at Claremont of Buffalo Grove. She was born February 5, 1925 in Chicago to William S. and Ruth A. (Vannewland) Fischer. Barbara loved to play volleyball, bowl, sew, and swim, but most of all she loved her family and grandchildren. She is survived by her husband of 70 years, Willard, whom she married on August 23, 1944; her children, Greg (Paula) of Wildwood, and Bill and his fiancé, Susan, of Johnsburg, and Joe (Carol) of Gurnee; 15 grandchildren; and 30 great-grandchildren. She was preceded in death by her parents; son, John; and two sisters, Shirley and Mary Jane. Friends of the family may visit from 4:00 p.m. until 8:00 p.m. on Wednesday, October 1, 2014 at Strang Funeral Chapel & Crematorium, 410 East Belvidere Road, Grayslake, IL 60030. Funeral services will be held at 10:00 a.m., Thursday, October 2, 2014 at Strang Funeral Chapel with interment at Abraham Lincoln National Cemetery in Elwood, IL. For information, please call 847-223-8122 or visit www.strangfuneral.org. George Patrick “Pat” Collins of Grayslake, 74, died September 27 with family by his side. He was born September 13, 1940, in Evanston the son of the late George P. Collins and Ruth (nee: Mau) Collins. Pat leaves his loving wife of 48 years, Judith (nee: Graham), five beloved children Robert (Michelle), Kenneth, Margaret (Patrick) Hynes, John, and Daniel (Monty), proud grandpa of Zoe and Paige Collins, Sophie, Rita, and Bridget Hynes, and the brother of Frank (Judith), James (Joan), and the late Mary (Dan) Miller. He was a graduate of the American Academy of Art. Pat formed his own advertising agency, Collins Advertising Art, and often told his children he never had to go to work because he was going to “fun”, by doing what he loved each day. When he retired, he was able to spend his days as a watercolor artist. His personally designed Christmas cards were eagerly awaited each year by friends and family, many of whom framed them to display in their homes. A visitation is scheduled for Saturday November 1, 2014 from 12:00pm until 4:00pm with a celebration of life commencing at 4:00pm at Strang Funeral Chapel & Crematorium 410 E. Belvidere Rd. Grayslake, IL. For more information please log onto www.strangfuneral.org or call (847)223-8122. Margaret “Marti” Leider, 63, died Tuesday, Sept. 23, 2014. Born in Brooklyn, N.Y., to Virginia and Hugh Robert McAteer, she graduated from Carmel High School in 1969. Marti married Steven Jay Leider on Nov. 25, 1972. A loving, devoted mother to their three children, she attended every school event, chauffered every night of the week and watched countless baseball games. Marti was co-owner and store manager for Leiders Garden Greenery, and the friendly face of the family business in Grayslake, Ill., for nearly 40 years. Maintaining old and building new relationships throughout her life, she never wanted more than family, friends and a glass of chardonnay. Marti is survived by her husband, Steve; children, Megan (Tom Henkey), Brian (Caitlin Zvoleff) and Nicholas (Jenny Bradley); and brother Robert McAteer (Linda). Memorial visitation will be Thursday, Oct. 2, at Strang Funeral Chapel, 410 E. Belvidere Rd., Grayslake, Ill., from 3 p.m.-8 p.m. Funeral services will be held at 11 a.m., Friday, Oct. 3, at St. Gilbert Catholic Church, 301 E. Belvidere Rd., Grayslake, Ill. A foundation in her honor will be established in the near future. Diana Mae Gross, age 64, a resident of Grayslake, passed away Wednesday, September 17, 2014 at her home. She was born in Fort Hood, Texas on January 21, 1950 to Kenneth Lloyd and Betty Hilma (Hetzel) Gross. Diana was a member of the Village Church of Gurnee and loved to play cards. She is survived by her sister-in-law, Rosanne Gross, her niece, Amanda Gross, and her nephew, Adam Gross. She was preceded in death by her parents and her brothers, Robert and Donald. Funeral services for Diana are pending. Memorial contributions may be made to the Village Church of Gurnee, 1319 North Hunt Club Road, Gurnee, IL 60031. All arrangements were entrusted to Strang Funeral Chapel & Crematorium, 410 East Belvidere Road, Grayslake, IL 60030. For information, please call 847-223-8122 or visit www.strangfuneral.org. Kayla Marie Stos, 22, born March 8, 1992 passed away Friday, September 5, 2014. Kayla was a 2010 graduate of Wauconda High School and an avid softball player. She was a member of the Northern Ice Fastpitch travel team as well as a member of the Wauconda Softball team which was their first ever Regional Championship Team. Kayla achieved North Suburban All Conference for her pitching and participated in several prestigious tournaments throughout the United States and Canada. In her free time she enjoyed spending quality time with her son Noah, and visiting with family and friends. Kayla was a loving mother to son Noah Alan Howard and is survived by her mother Vanessa M. Sanchez (Stephen C. Lauer); her father Bradley A. Stos, maternal grandparents Camila (Richard Jr.) Eklund; Marco (Kathleen) Sabado, paternal grandparents Rosemary Smith; Walter (Nalita) Stos; George Smith, maternal great grandmothers Anna Sanchez; Kathleen Eklund, and numerous aunts, uncles and cousins. Kayla is preceded in death by maternal great grandfathers Julio Sanchez; Richard Eklund Sr., paternal great grandparents Albert (Ruth) Heisman; Walter (Anne) Stos; Earl (Olga) Smith. Visitation will be held on Friday, September 19, 2014 from 5:00pm until 8:00pm with a service commencing at 8:00pm at the Strang Funeral Chapel & Crematorium, 410 E. Belvidere Rd., Grayslake, IL 60030. In lieu of flowers, memorial fund donations made payable to Noah Howard can be sent to Strang Funeral Chapel & Crematorium; C/O Noah Howard son of Kayla Stos, 410 E. Belvidere Rd., Grayslake, IL, 60030. For more information please call (847) 223.8122 or www.strangfuneral.org. Arthur J. Wisniewski, born June 18, 1925 in Evanston, son of Michael and Lottie Wisniewski, passed away September 3, 2014. He served in the US Coast Guard on the USS Leonardwood during World War II. He lived in Evanston the majority of his life before retiring to Saddlebrook Farms with his beloved wife of 61 years, Marilyn, who passed away December 22, 2007. As the patriarch of the family he displayed such wisdom, forgiveness, devotion and compassion, to all those whose lives he touched. Arthur is survived by his loving children Jeffrey (Mary Jo) Wisniewski, Gail Chapman and Brad Wisniewski, proud grandfather of 8, great-grandfather of 7, and fond uncle to many nieces and nephews. He was preceded in death by his parents Michael and Lottie, his brother Chester, and his wife Marilyn, Friends of the family may visit Saturday, September 13, 2014 from 10:00am until 12:00 pm with a memorial service commencing at 12:00pm at STRANG FUNERAL CHAPEL & CREMATORIUM, 410 E. Belvidere Rd., Grayslake, IL 60030. In lieu of flowers the family has asked for donations to the American Cancer Society 100 Tri-State International Suite 125, Lincolnshire, Il 60069. Or to Zero The End Of Prostate Cancer, 515 King St. Suite 420 , Alexandria Va, 22314. For information, call 847-223-8122 or visit www.strangfuneral.org.